Spending over ten million bucks on a sci-fi fantasy for kids was a huge gamble in a cinematic era defined by gritty Earth-bound dramas, but as we all knew a week after its release, Star Wars paid off in a big way. So did the equally risky Topps trading card series devoted to George Lucas’s universe of sand and steel, and when he produced its sequel, another Topps series was inevitable. 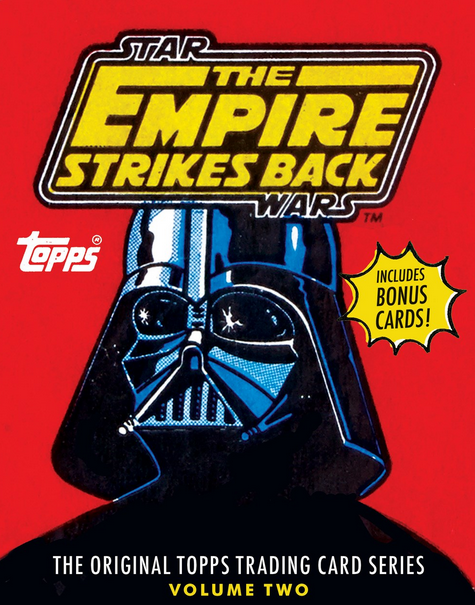 Just as Empire Strikes Back improved on the original Star Wars in a number of ways, Topps’ new cards were a step up too. The images on them covered the most visually accomplished episode more completely than the first series covered Star Wars. They were less repetitious and more eclectic with comic-booky illustrations and Ralph McQuarrie’s enchanting production paintings mingling with the usual promo and production photos, which include outtake scenes and behind-the-scenes moments. The quality of the images was also finer than the grainy, blurry shots on the first Star Wars cards. The excellence of Topps’ Empire Strikes Back cards makes Abrams’ new anthology of them both essential and frustrating. The increased number of cards in the series meant that Abrams could not allot an entire page to each card back and front, as it did in volume one. In volume two, most of the backs and fronts are paired on pages, but the smallness of these images is unnecessary and disappointing. 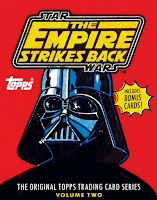 Whereas Star Wars: The Original Topps Trading Card Series represented its cards slightly larger than their original 2 ½" x 3 ½" dimensions, the paired images in The Empire Strikes Back: The Original Topps Trading Card Series Volume Two are shrunk down to 2 ⅛" x 3" even though there is plenty of room to spare on each page. This is particularly unfortunate when McQuarrie’s beautiful artwork is miniaturized. Thankfully the other illustrations are all presented full page. While that sizing issue can’t be dismissed (hopefully it will not be an issue when the Return of the Jedi cards anthology is published this summer), volume two is certainly lovingly packaged, with some great extras, such as full-page images of Topps’ large-size photo cards, ads for Topps’ plastic character-head candy dispensers, a packet of six bonus cards, and Gary Gerani’s introductory essay and commentaries, which are just as entertaining as—if less abundant than—the ones in volume one. His copy on the original cards reveals that his wit was in play from the very beginning. Best caption: “A PILE OF SEE-THREEPIO” labeling a shot of the recently blasted droid. Best Shakespearean allusion: “ALAS, POOR THREEPIO” labeling a shot of Chewbacca holding said droid’s severed head. 21 Underrated Prince Songs You Need to Hear Now!